We are moving to a new site format & apologize in advance for any & all inconveniences! 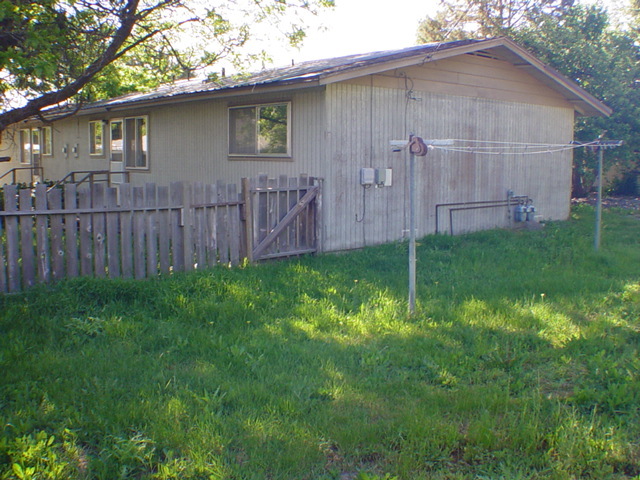 Hello and thank you for looking for more information on the home at 1160 Maple Street. 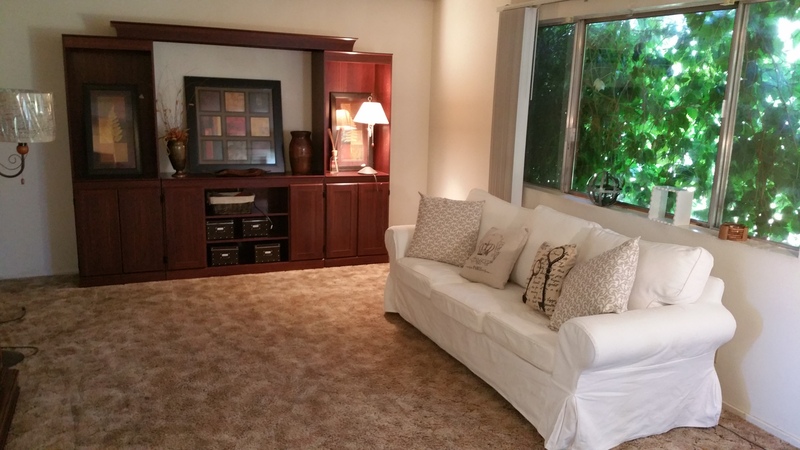 This quiet 2 bedroom, 1 bath home is available for rent. It is located on dead end street with the mountains behind - great for quiet walks or kids to wander. Kitchen just remodeled with high end Maple Kitchen cabinets & doors includes designer refrigerator cabinet, 7 foot tall by 24" wide pantry and oversized counter with bar seating for kitchen sink area. About a $10,000 upgrade - full kitchen remodel. Kitchen totally redesigned to include work zones now - you have a prep zone, pantry zone, cooking zone and cleaning zone - multiple people can be in kitchen at the same time due to the individual work zones. Also peninsula now allows for a much nice laundry zone as well eating area with a nice view of the hillside behind. This is a kitchen that you would normally find in $150,000 or higher homes. Truly fabulous! Kitchen just remodeled with high end Maple Kitchen cabinets & doors includes designer refrigerator cabinet, 7 foot tall by 24" wide pantry and oversized counter with bar seating for kitchen sink area. Photos available upon request! About a $10,000 upgrade - full kitchen remodel. This home features newer kitchen appliances (Microhood, range, dishwasher & in 2011 an energy efficient refrigerator), extra large bedrooms, very large yard - with a small private fenced in area. Even includes delicious raspberry bush (please water to keep it thriving). Lots of drawers for more storage & organizing space! Rubbed oil bronze door & drawer pulls. Also includes high end travertine laminate flooring which is easy to clean and looks ever so fabulous! Bathroom Remodel - Spa Like - includes Granite countertop , new designer dark vanity, Milano Grass Cloth Allure Flooring and Ann Sacks glass tile backsplash for sink area. Sink is White vessel with designer faucet. Also installing additional medicine cabinet for more storage space. Extra Bonus - dimmer switch installed so you can dim the lights while you take a relaxing bath. Brand New 3/4 Glass front door too! Gorgeous new granite topped vanity with vessel sink! Home has a super efficient Gas Forced Air Heat system with hot water combined (@$5500 system) with a programmable thermostat. All windows have storms & screens & storm/screen doors - decor storm/screen door also recently installed. 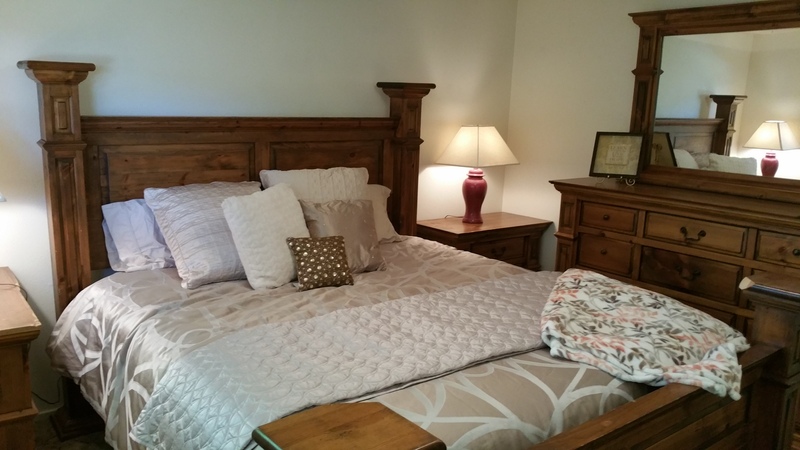 The Master bedroom easily accommodates King Size bed & dresser. Second bedroom is quite large and easily holds queen and dresser - both have large closets. Master Bedroom Fits King Bed easily. This is a huge set and there was still room to walk around the bed easily. Washer & Dryer can rented for $50 a month or included on a 2 year lease. Owner pays for Lawn mowing & some snow removal which is @ a $100 a month savings over other properties. Rent: $1245 $1295 a month with a 12 lease. 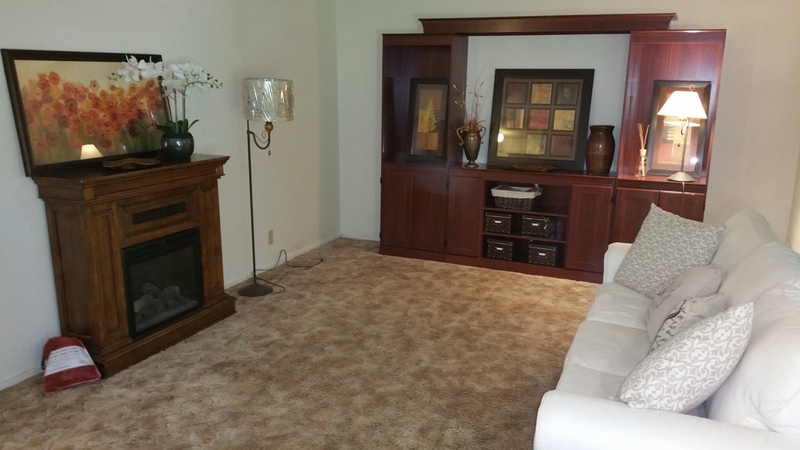 Includes lawn mowing, sewer, efireplace plus washer & dryer. 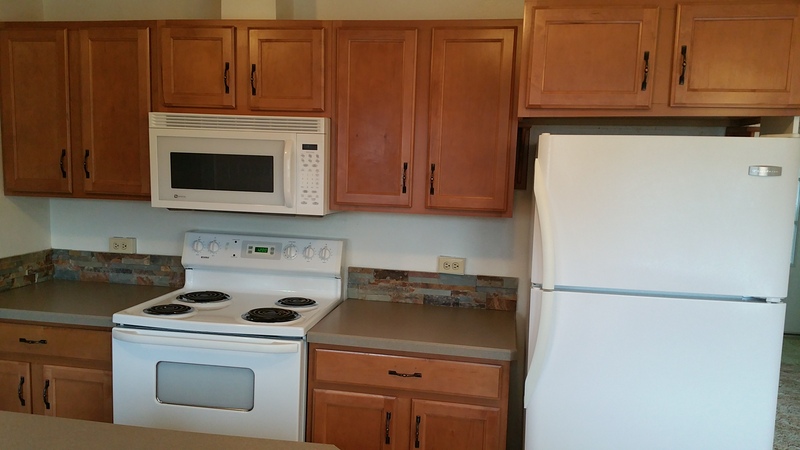 Shorter Term leases are available: $1345 a month with a 9 month lease or $1395 a month with a 6 month lease. Prices listed include sewer and lawn mowing. Good application? We'll take 3 payments on first month's rent starting next month as long as deposit is paid in full. Plus sign up for a longer term lease and we'll install the car safe entry system at no extra charge. Rent with garage is $75 more per month. Includes outlets & lights, auto garage door opener with keyless entry touchpadCost of comparable storage unit is @$105 per month. Garage also features an automatic garage door opener. Only one garage available for rent - rent it before it's gone! Want gorgeous Hickory Laminate Floors instead? Add $35 to the monthly rent for the Living Room or $55 for the living room, hall and two bedrooms to be covered in gorgeous Hickory Floors - easy to clean and great for allergy sufferers as well. Recently installed newer dishwasher, ice maker & Micro-hood over the new range. He will install new laminate flooring in the kitchen with a 12 month lease and rent increase -see below for details. There is a fenced back yard for entertaining & pets/kids, + extra large back area that you can put in a garden also includes clothes line which backs up to the alley that no one uses. All homes are scheduled to have their exterior siding replaced Late this Summer/Fall with high end Nichiha Cement Shake Siding and owners had the courtyard resurfaced $4K job - looks fabulous. Laundry rooms & living rooms back up to each other. 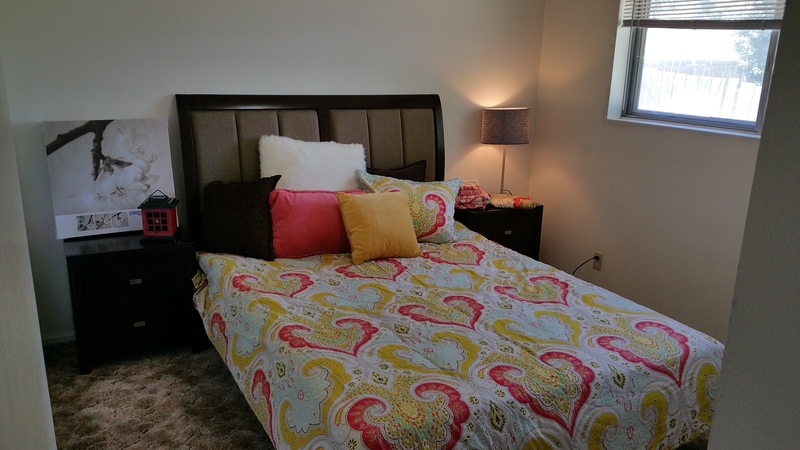 Bedrooms are on opposite ends of the duplex which is a very nice design & quiet too! Plenty off-street parking & oversized garage available for rent only on a year lease with additional $75 per month includes auto garage door opener & there is power in the garage. Huge back yard with laundry line. Small fenced area will need to be re-seeded in the spring. If you would like to see the inside of this home, please pick up an application located by our front door at 2300 Biehn Street or you can fill it out online - Rental Application. Once you have filled out the application you can call us Toll Free 1-866-883-3421 & please press # to leave a message or email us. We will return your call within 48 hours. We request that you view the outside of the home before the inside so make sure you drive by the home first. Install efireplace with remote control Completed 4/2012. Install efireplace into Entertainment center. Purchased and install planned with $8 per month rent increase &/or longer term lease. Install Hickory Wood Laminate flooring in Living Room/Hall. Purchased and install planned with $25 per month rent increase &/or longer term lease. Install Hickory Wood Laminate flooring in Master bedroom. Purchased and install planned with $15 per month rent increase &/or longer term lease. Install Hickory Wood Laminate flooring in 2nd bedroom. Purchased and install planned with $8 per month rent increase &/or longer term lease. Install automatic sprinkler and drip system on property. Partially purchase and install planned with rent increase &/or longer term lease. Replace siding with All new Nichiha fiber cement shake siding. Purchased and install on hold. Planned for 2017. 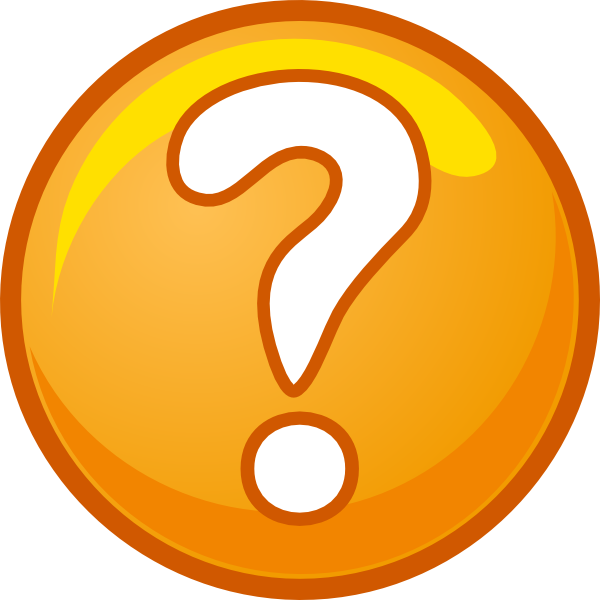 ** Please Note ** Homes on Rent/Web Specials do not include home's extras: i.e. 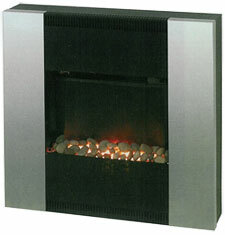 : PUR, electric fireplace units, washer/dryers, snow removal, landscape care, basement use, etc. If you want any of these, they can be arranged with an extra monthly fee ** - This does not apply to our standard lease terms. They include whatever is offered at that particular home as long as the full rent is paid. Standard Amenities Available in most of our Homes! 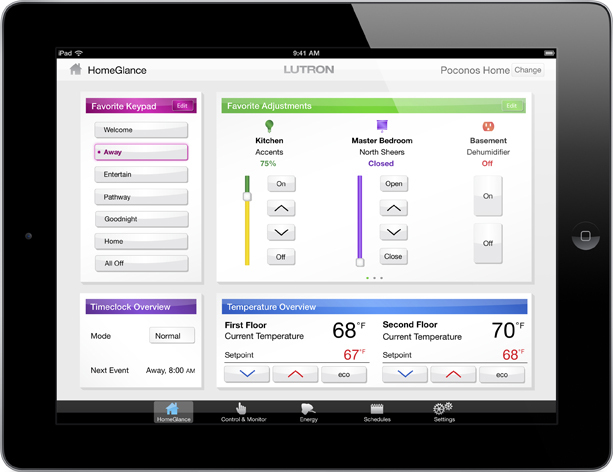 Lutron Maestro Wireless Lights & pico controls - click here for details - About a $1200 upgrade for two bedroom home! 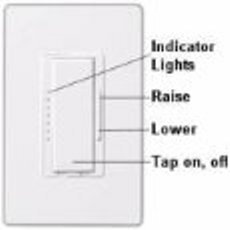 Only works with incandescent & halogen lights - Lutron's Digital Fade Super Smart Dimmers - At the touch of a button, dimmer can go immediately to a favorite preset light level, fade-to-off, or adjust manually. Double tap to go to full brightness or Hold for a few seconds and it will slow fade off so you can walk from one room to another in comfort instead of darkness. Bulb dimmed at 65% last 30x longer - better than CFL's and without the harsh unnatural light. Lutron light dimmers are being installed in most of our homes - some even with car safe entry systems (turn lights on & off from your car) and Lutron Maestro wireless under cabinet lights in the kitchen that turn on and off when you enter the room - Not only are these just cool beyond words but they also offer a level of safety as well! 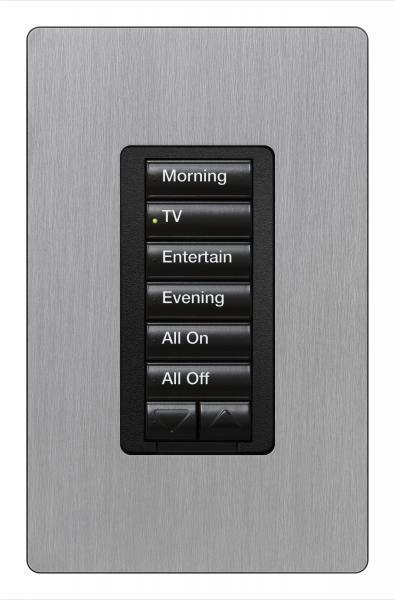 Automatic Light Controls - Brand New Gadget available in most of our homes! We want you to enjoy your new home & also live there safely! Never come home in the dark again! Fire Extinguishers are provided in all of our homes! PUR water Filter Mounts are provided in most of our homes! 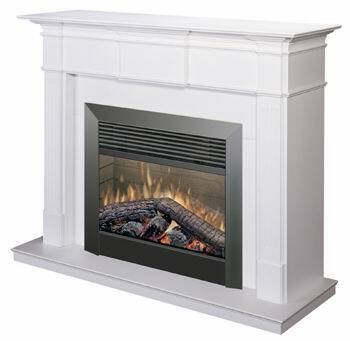 Electric Fireplaces can be installed for $18-$45 extra a month in rent on a minimum stay of 12 months. Incredibly realistic 3-D flame! No mess, no hassle, no worry - 4-season enjoyment. You can run the flames with or without heat. Remote Control. Different mantels available from all white to oak, cherry, etc. Corner mantels & also wall mount types available. Not Ready to move yet? Email us what you are looking for - size, # of bedrooms, monthly price range, date you would like to move & we will check our lease expiration dates and get you a list of homes coming available. If you would like to see the inside of this home, please pick up an application located by our front door at 2300 Biehn Street or you can print one out online - Rental Application. Once you have filled out the application you can call us Toll Free 1-866-883-3421 & please press # to leave a message or email us at info@t-crealty.com . We will return your call within 48 hours. We request that you view the outside of the home before the inside so make sure you drive by the home first. You can also click here: Rental Application and print out an application or to receive one by fax - call 883-3421 and enter 4010 and press 07 or you can email us at info@t-crealty.com . In order to qualify to rent this home you will need to have a net income per month of 2.5 times the rent a month and no recent evictions, convictions, collections or bankruptcies. Exceptions may be made with additional security deposits &/or cosigners or both at manager's discretion. Additional security deposits may be held in promissory note at manager's discretion. You will need to pay an applicant screening charge of $30 per adult occupant after you have viewed the home & have decided you want to rent it. You will also need to pay the equivalent of two month's rent for a security deposit. We may allow one pet over 3 years or possibly two pets over 5 years without an additional security deposit for pet(s) - You must have positive rental references for pet(s) and complete our pet application. If you have a clean credit report and application - we may allow you to sign a promissory note and break this deposit &/or rent up into ta maximum of three or less payments. We run both court, criminal, & credit records checks. For our detailed Applicant Screening "Facially Neutral Housing Policy" Disclosure - Please email us at info@t-crealty.com or click here for our policy online or here for our full disclosure list- Please specify the home you want to view as some owners have different policies for different homes. (Our policies are subject to change at any time). Washer & Dryers are Available for $25-50 a month - depends on unit, age of units, & whether they have a hand wash/delicate cycles or not. 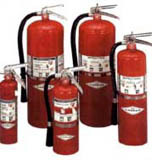 We provide PUR Water Filter Mounts & Fire extinguishers in all of our homes. All deposits are 100 % refundable provided no damage occurs and you return your home clean with your rental account current. The first person in with their application, applicant screening charge of $30 per adult occupant, and has viewed the home & wants to rent it will be first in line for their application to be processed. Application processing times are 2-5 business days. If you would like to receive a faxed application and screening information, click here or Call 883-3421, enter ext. 4010 & then please press 07. If you would like to receive this information by mail or email, - email us at info@t-crealty.com or Call Toll Free 1-866-883-3421 - press # and leave your mail or email address. You can get more information here at our Rental Center. This information is provided to you by Teresa N. Snyder and her Home and Loan Finder Hotline. If you would like to see if you can qualify for her exclusive zero to three percent down loan programs, just email her now at teresa@t-crealty.com or Call Toll Free 1-866-883-3421 & key in # to leave her a message - she will return your call within 48 hours. Please pick your personal return call time of either between 11 am to Noon or 6 to 7 pm and leave the best number to contact you at that time. This is a free service provided by Teresa N. Snyder and her Home and Loan Finder Hotline sponsored by Town & Country Realty. Thank you for visiting our website and we wish you the best in your home search.